“When you think of Little Jimmy Dickens, you smile … He’s just one of those people who spreads happy everywhere he goes.” That’s how Carrie Underwood described the 4-foot, 11-inch star with the flashy rhinestone suits, big guitar, quick smile, and often humorous songs. 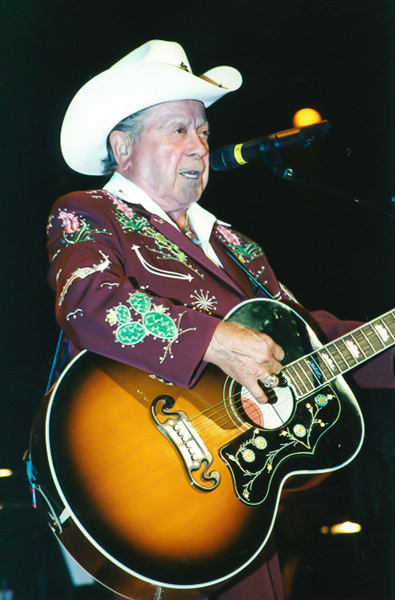 “Tater”—as he was dubbed by Hank Williams from one of Jimmy’s most popular songs—brought joy to people throughout the world with his music and his entertainment skills. He was the first country singer to travel around the world on tour, during the mid-1960s. Little Jimmy Dickens was a long-time beloved member of the Grand Ole Opry—and its elder statesman before passing away at age 94 in early 2015. James Cecil Dickens was born on December 19, 1920, in a town called Bolt, in the coalmine region of southeastern West Virginia. He was the oldest of 13 children in his family. He grew up exposed to music played by his singing, guitar-picking mother and by a number of coalminer relatives. While still a student in high school, he began singing on a radio show based in Beckley, West Virginia. He next played for a radio station in Fairmont, West Virginia, where he met T. Texas Tyler, whom he followed to Indianapolis in 1941 to play on Tyler’s new radio show. He first began to call himself “Little Jimmy Dickens” while performing in that city. Little Jimmy Dickens and Kitty Wells. The restless young man subsequently moved to Cincinnati; Topeka, Kansas; and, in 1947, Saginaw, Michigan. Dickens’ career got a big boost when he played a show with Grand Ole Opry star Roy Acuff in Saginaw. Acuff was so impressed that he helped Dickens get a regular spot among the Opry’s cast in 1948, as well as a recording contract with Columbia Records. Dickens found much success with Columbia, releasing a series of hit records from 1949 through the mid-‘60s with the label. Many of these songs were funny, novelty tunes that made humorous observations about country “hillbilly” life, or even about Jimmy’s short stature. It was the “Tater” tune, about Jimmy as a boy having to wait to eat while company got to eat first, that prompted Hank Williams to give Jimmy his nickname. But it was “Bird of Paradise” that would be Dickens’ biggest hit. It flew to number one on the country charts, and number 15 on the pop charts, in 1965. With lyrics such as “May the bird of paradise fly up your nose, may an elephant caress you with his toes, may your wife be plagued with runners in her hose…”, the song brought laughs to many with its rhyming insults. Jimmy and his band, the Country Boys, performing “May the Bird of Paradise Fly Up Your Nose” on The Bobby Lord Show in 1965. Rockabilly, done Jimmy Dickens style—“(I Got) a Hole in My Pocket,” from 1958. The mid-1960s found Dickens to be one of the busiest—and most travelled—artists in country music. He appeared on The Tonight Show Starring Johnny Carson, as well as other TV talk shows, and he was in a couple country-themed movies. He plowed new ground for country singers by visiting Europe 13 times to perform. He entertained American troops in Vietnam on two separate occasions. Little Jimmy Dickens at the Nashville Palace. His 1964 international concert tour was the first in which a country singer fully circled the globe, with shows in Hawaii, Japan, Taiwan, Hong Kong, Vietnam, Turkey, Denmark, West Germany, Canada, and Minnesota within a three-month span. His performances were famous for his high-energy showmanship and for the extraordinary musicianship of his band, the Country Boys. Dickens switched record labels during the late 1960s and early 1970s—first to Decca, then to United Artists. In 1975, he rejoined the Grand Ole Opry, which he had left in 1957 to perform with the touring Philip Morris Country Music Show. In 1983, the Country Music Hall of Fame welcomed Dickens as its newest inductee. Jimmy joins George Jones, Bill Anderson, Dolly Parton, and James Burton (on guitar) on “Cornography,” from Brad Paisley’s 2005 album Time Well Wasted. Dickens focused most of his performing during the 2000s on the Grand Ole Opry. After the death of 91-year-old Hank Locklin in 2009, Dickens, at age 88, became the oldest member of the Opry. Jimmy maintained his great sense of humor throughout his life. At the Country Music Association’s awards show in 2011, he dressed like young pop star Justin Bieber—with a leather jacket, baggy pants, and sideways baseball cap over a wig. In 2012, he dressed like Marilyn Monroe to wish Paisley a happy birthday at the Opry. “Marilyn Monroe” sings happy birthday to Brad Paisley at the Grand Ole Opry in 2012. Dickens performed at the Opry for the last time on December 20, 2014, the day after his 94th birthday. On Christmas Day, he suffered a stroke and was taken to a Nashville-area hospital, where he died on January 2, 2015. 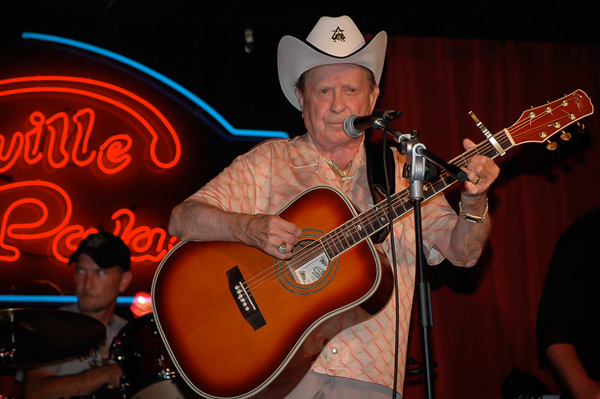 Little Jimmy Dickens dies at age 94. CMT. January 2, 2015. Little Jimmy Dickens, beloved ‘Opry’ star, dies at 94. Tennessean. January 2, 2015. 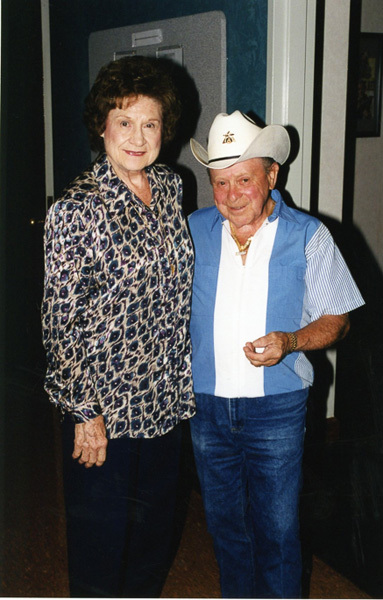 Remembering Little Jimmy Dickens’ life and legacy [pictures]. The Boot. January 2, 2018.